A basic measurement in groundwater studies is that of water levels in wells. The measurement of the groundwater level in a well is frequently conducted in conjunction with groundwater sampling to determine the "free" water surface. Surface measurements can be used to establish groundwater direction and gradients. Groundwater level and well depth measurements are needed to determine the volume of water or drawdown in the well casing for proper purging. 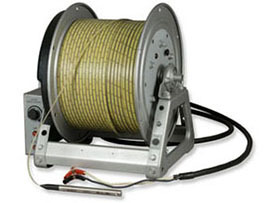 Electric tapes are mounted on a hand-cranked or powered supply reel that contains the batteries and "indicator" electronics for signaling when the circuit is closed. Geotech portable water level meters are designed to provide reliable and accurate measurements of groundwater levels up to 3000 feet deep. The Geotech ET and ETL Portable Water Level Meters are designed to provide reliable and accurate measurements of groundwater levels. Water level readings are taken at the top of the casing with accuracy to within 1/100 of a foot (3mm). ET versions come in 100', 200', and 300' tape lengths (30m, 60m, and 100m). 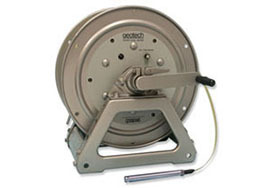 ETL versions come in 500', 750', and 1000' tape lengths (150m, 225m, and 300m). 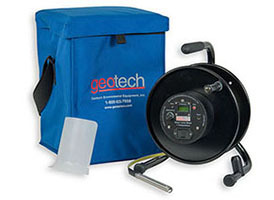 Geotech Portable Water Level Meters + Temperature are designed to provide reliable and accurate measurements of groundwater levels and temperature. Readings are conveniently taken at the top of the casing with accuracy to within 1/100 of a foot and ± 1°F (temperature accuracy). 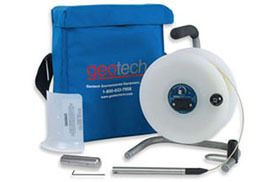 Geotech Portable Water Level Meters + Temperature are available in 100', 200', 300', 500', 750', and 1000' tape lengths (30m, 60m, 100m, 150m, 225m, and 300m). Geotech Water Level Meters are portable instruments used to accurately measure water levels in monitoring wells and bore holes. The meter detects water levels with a 5/8" (15.8mm) O.D. stainless steel weighted probe attached to a polyethylene tape marked to 1/100 of a foot (3mm). 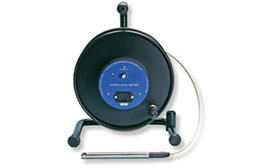 These water level meters are available in 1500', 2000', 2500', and 3000' tape lengths (450, 600, 750, and 925 meters).